He’s the controversial pastor who famously questioned his belief regarding the traditionally held Christian view of hell in his 2011 book, Love Wins, causing many in the religious community to label him a heretic and worse. This Friday, Michigan megachurch founder/Oprah-approved spiritualist/gay marriage advocate Rob Bell comes to the Knitting Factory. Yes, the Knitting Factory, where people often arrive wearing little, drink a bit too much and listen to music with lyrics not always compatible with righteous teachings. As part of his Everything is Spiritual speaking tour, Bell uses the TED Talks approach to discuss the how and why of existence in a fascinating and inclusive way. While he’s toured under the Everything is Spiritual moniker since 2006, he says this 2015 tour is new, full of fresh ideas and includes a different-shaped whiteboard behind him to better illustrate concepts. Also note: For just $101 tomorrow, you can score some pre-show conversation with Bell, priority seating and a signed copy of The Zimzum Of Love, the most recent book he wrote with his wife Kristen about marriage. We caught up with Bell earlier this week. INLANDER: Instead of asking why you’re coming through the Knitting Factory of all places — I’m turning this around — why aren’t more pastors coming through this place or places like it? 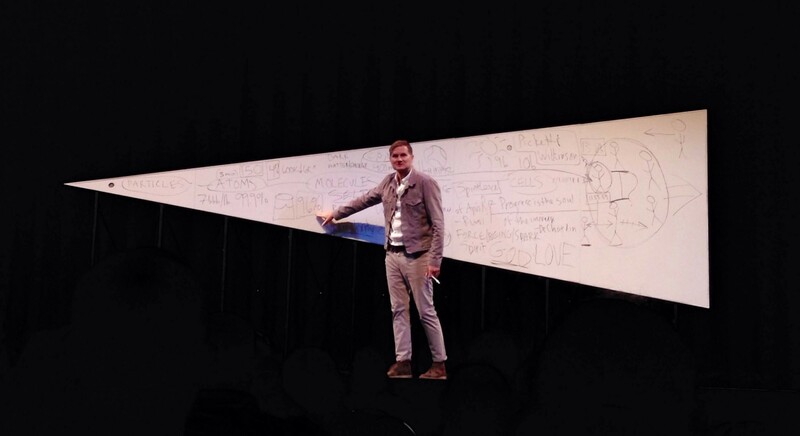 ROB BELL: I can’t answer for other people. But I can tell you that I was in a band at Wheaton College that broke up because of the usual problem — we all had to get real jobs (full story on that here). And somewhere I stumbled into an art form called the sermon. What happened to the sermon?! Like Martin Luther King’s “I Have a Dream” speech, which was a sermon, it’s the ultimate provocative art form where you’re inspired and convicted and moved. And I got into pastoring because of the art form. I started a church, but I felt the art form needed to be freed for all people. A particular religion over others was never interesting to me. I wanted to talk to people about what it means to be alive and what it means to be human. How do you worry less? These are questions that all people have. The first Everything is Spiritual tour was in 2006 and I thought there was a way to take this further — to take this to this place where I hang out, where I see my favorite bands. It felt like a homecoming to places like the Knitting Factory. Are you still a pastor? Does that ever go away? Four years ago, I left Mars Hill Bible Church (different from the now defunct Mars Hill Church founded in Seattle by Mark Driscoll) and moved to L.A. with my family. I feel like more of a pastor than ever, now that I’m no longer carrying an institution on my shoulders. I don’t have a local flock, either, if that’s what you’re asking. Let’s get back to your band. I was the lead singer and we called ourselves _ ton bundle. We sounded like, well, it was the birth of alternative, so not Mariah Carey. Talking Heads and Primus inspired us, but our music was mostly just us trying to be good. Did you play Christian music? I thought that Christian was a noun, a person looking for authenticity. I never understood that idea that a band could be Christian or something could be Christian. It just is. Have you ever read the comments section of anything about you on the Internet? Martin Bashir’s interview with you after Love Wins came out, have you gotten over that one yet? Is that crazy that you get to hang out with Oprah sometimes? What is it like to be a part of her universe? It’s incredible; she’s the real thing. All those books she recommends, she reads them. All those people she interviews, she listened to. Most people who know her know how authentic she is. She’s a master spiritual teacher. She has extraordinary spirit. A stunning breadth of wisdom and insight and that’s what strikes you. Here’s an iconic person of our generation and she is really alive and inspiring. There’s an actual heartbeat in there. What’s up with your TV show, is that still happening? We did an episode on the OWN network. The Rob Bell Show is alive and well, just not on that network. It was a great experience to make that show with that group but it just was hard being on a network that my friends couldn’t watch the show right away afterward in bite-size clips. So something is still in the works. It’s all about making things, that is where the joy always is for me — the next sermon, the next book, to always have something percolating. For your recent book written with your wife, how did you find, as you say, a new way to understand marriage? I had been reading the early Kabala mystics. There’s this esoteric commentary about the idea of zimzum, this act of withdrawing and contracting. I love words and it definitely stuck out to me. I told Kristen about it and we thought "what if we applied this to marriage?" This space between you is a generative space. Big fights start with a small comment and grow, but you put something small and kind and generous in between you and it can last for months. I’d never heard of the space between us in marriage. Most of the times we heard people talk about marriage it was just so cheesy and we wanted to throw up in our mouths. We kept building these insights about the space. We encountered this as a living, dynamic flow between people. Always adjusting. No one ever framed marriage that way. Mostly, it was a battle to stay together and just hope it will work out. Life is an adventure and there’s this person you get to go on the adventure with. Talk about your writing? Are there days you don’t want to do that? Good Lord, my days start when I take the kids to school and then walk the dog and then sit down at the desk and there’s a three-hour window. And if I’m there and just do the work, somehow a book appears. It’s showing up every day and typing that next sentence. To write, I have to have seen something that has woken me up so it starts with my own exploration with those “oh my word” moments. Then it’s the pure, undiluted slog of thinking how can I show people what I’ve seen. I love it. It is not uncommon for a day or a week where I work all day and produce a sentence and then delete it. Right now, there are about four books in my head so I have to pick which one is the hottest. With this tour, what sort of folks are you reaching for? Who do you want to come out to this? It’s a two-hour one-man show. I talk about what we know from science and what we know about how our hearts work, that moving beyond ourselves can be illustrated in what we know in the universe expanding. Give or take, I worked very hard with the content. My awareness is your life is a gift and what you do with it matters, it brings me deep joy to do this. People are fine with me being a Christian pastor or talking about Jesus or non-violence up there. I’m fully me. Part of the joy is people from every sort of background coming out to this. If you stood next to me at the meet and greet you wouldn’t believe who is there. I’ve just learned not to be surprised by anything. I think that we are hungry more than ever to not be accessed with our senses. The modern world gave us hospitals and 10,000 songs in our pockets but this extraordinary innovation had very little to do with the spiritual side of things. Lots of folks did the house and the family and the vacation and the retirement and they did it by the book but they’re still not satisfied. They went looking for the big answers in the churches, in the places that were supposed to cultivate awe, but they felt like it was a step backward. It’s an existential thud. I’m trying to give people a public space to be free to be who they are. And to hear someone take a shot about the big stories. We have very few blatantly spiritual spaces that haven’t been co-opted. Are you constantly wrestling with these big questions? Is there a lot going on in your mind at once? I have a lot of fun. I go surfing. I enjoy my family. When I took myself seriously, when I did that, it blew up in my face. So I assume there’s an amount of exploration at the heart of what I do with my day. I have questions like everyone else. But it’s not all serious.